It’s no secret that the labor movement of the United States is in serious danger. Every year union membership continues to shrink. This happens despite large scale organizing attempts by the minority of unions willing to do something about it. Having put all their eggs in the basket of the Democrats, AFL-CIO and Change To Win unions were handed a spectacular failure with the election of a Republican sweep of all branches of government. All this comes on the heels of a broad decay of living conditions amongst the working class in general, but disproportionately concentrated upon women, blacks, latinos, and indigenous communities in particular. The Democrats kept their loyalty to business interests at all costs and the unions largely didn’t flinch. Is an injury to one union, an injury to all workers? Some of the implications of this may not be obvious. The old stereotypical image of unions as bastions of white males with cushy jobs was a distorted picture of the truth, but changes in the past decades have shifted the situation. Over the past thirty years unions have become closer to gender parity, are overrepresented by blacks compared to the broader population, and is approaching racial parity if it continues it’s trajectory.2 Labor unions for all their faults have done better on these points than the activist left. The labor movement is more diverse and representative than the less and weakening of the labor movement would thereby also impact the progressive landscape more generally. The erosion of the last bastions of decent working class jobs thus is likely to have a particular impact in the oppressed communities already most effected by the financial crisis and subsequent precarity that spread across the working class. It is widely know that loss of union jobs decreases wages for non-union workers as well.3 Those losses are concentrated amongst those locked out of the alternative paths to better jobs: particularly women, immigrants, blacks and latinos. Public sector de-unionization then will target and impact those already hardest hit in recent years and under attack by the renewed racist, patriarchal, and xenophobic efforts of the right. Additionally, being one of the few organized forces behind the Democratic Party makes the unions a tempting target of the Republicans who hold the legislative reigns. Not only will such support be threatened by an emboldened conservative movement, but also whatever meager checks there were on progressive policy by the labor movement will be undermined by their loss of objective strength on the one hand (should unionization rates fall further), populist challenges from the right on the other, and the Democrat’s foolhardy attempt to lure Republican-linked capitalists. How did we get here? The unions are not just organizations of workers, but organizations with political objectives and ideology. We were reminded of this fact when Wikileaks exposed the leader of AFT coordinating with the Hillary Clinton campaign to “go after” National Nurses United for their support of Bernie.4 The AFL-CIO and CTW have remained tied to the political policies and destinies of the capitalist political class organized in the Democratic Party. This is the same party which has pursued policies ultimately to bring about labor’s decline. There are many false steps that led to the labor movement allying with its enemies right over the Trump cliff. The Cold War purges of the militant independent unions inside and outside CIO dismantled democratic leadership built from the organizing wave of the thirties through the strike waves at the closing of WWII.5 In it’s place it installed a loyal bureaucracy that was institutionalized through collaboration with employers and the government in the context of unparalleled world economic expansion and rising living standards for workers. Eliminating the only organized opposition to the bureaucracies paved the way for generations of corruption, union graft, and organized crime. This led to the shameful path of American labor that put the leadership often against the working class in dramatic ways; for example when the AFL-CIO worked for the CIA to help murder union organizers in Latin America.6 As that social abundance wore thin in the crises of the 1970s, the ruling class moved on but labor didn’t. When the bosses no longer needed the unions, they began to get rid of them. Labor, under the yoke of bureaucracies thoroughly insulated from the conditions of its members, mostly took this lying down. Across the world governments, left and right, attacked social safety nets, union protections, and the benefits workers had won through decades of direct action. The right-wing origins of neoliberalism is widely known. Though less acknowledged, the global socialist and social democratic left was also key in its spread. As Sader showed, in Latin America socialists, former Marxist guerrillas, and progressive helped neoliberalism sweep the Americas.7 Mudge similarly drew out the intellectual roots and left support for the neoliberal attacks on Europe’s social programs.8 Workers, having placed their faith in the hands of political parties, were betrayed across the political spectrum. This pattern appears poised to repeat as the working class in the United States is yet to carve out an independent path from the political classes that exploit them. Unions, particularly in the United States, remained a loyal opposition and stood as watchmen while their members were attacked, their organizations shrunk, and the populace without access to the benefits of union membership grew. Total collapse was staved off by the gains made largely in public sector as a result of the illegal wildcat strike wave in the 1970s, wherein such organizing was legalized. 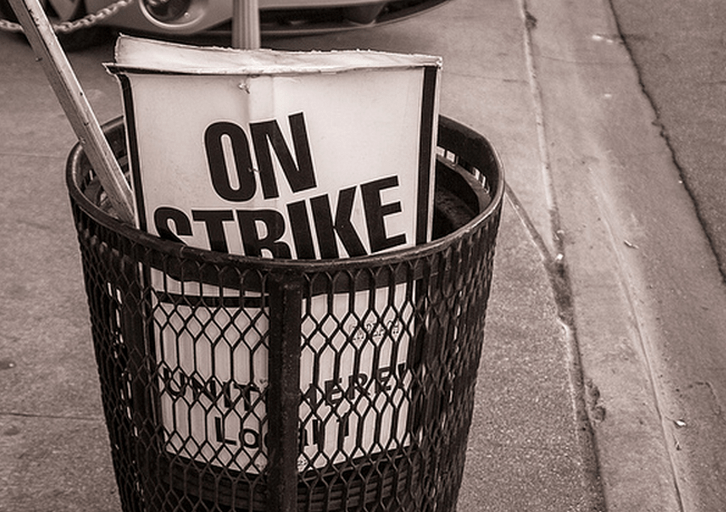 Before the wildcat strikes of the postal workers and other public employees, public sector unions had no right to collective bargaining and strikes were largely illegal. The new influx of public sector unions would swell the ranks but not fundamentally change the dynamic. The Reagan years broke the fighting capacity of the unions and relegated them to a defensive role perhaps up to the present. With the fall out from the Reagan “revolution”, with it’s attacks on the power of unions, public and service sector unions in particular shifted strategy towards mobilizing as vote-getting machines for the Democratic party. The leadership of these unions wrote a blank check without any serious attempt for policy demands, and keep on writing it come what may in the face of false promises (such as the abandonment of the Employee Free Choice Act when Democrats controlled the House and Senate in Obama’s first term)9, neoliberal attacks on health care, immigration, and trade agreements. The broader working class was left out of this picture with many unions resorting to parochially defending it’s shrinking membership while the country became worse and worse off. Since the seventies many construction unions receive more money from profits off their pension funds than from membership dues. This creates a financial disincentive to organize for those lucky enough to benefit from the union acting as an investor (and sometimes in anti-worker non-union construction projects). The less members, the bigger the pile of money for those left standing. The isolation of the labor movement is a danger easily exploited by employers. Whenever the ILWU and TWA go on strike for example the media attempts to exploit resentment from nonunion workers inconvenienced by transportation disruptions. Our shared issues as workers and the dangerous work environments are downplayed and while hammering in the idea that these workers are spoiled while the rest of us toil. This will not go away until there are unions willing to fight for all workers and regain the trust of the public. At the same time as the labor movement’s decline, there is new hope amongst some activists for the state to step in and save workers. Progressive pushes inside establishment parties and electoral socialism has gained a new lease on life. This is particularly true in light of Kshama Sawant’s victory, the candidacy of Bernie Sanders on a social democratic platform, and struggles within the Democratic Party as we speak. This is strange as it comes on the heels of the global discrediting of social democratic movements, having only recently ushered in neoliberalism, led failing governments across Europe and Latin America, and been increasingly out maneuvered by the insurgent right. Syriza and Podemos promised workers to reverse the attacks only to reverse course in power. Brazil and Argentina’s electoral left dynasties were defeated amidst stagnation and a failure to realize their parties promises for workers in an atmosphere of increased tension with the official unions of their respective countries. Why then is now the time to revisit this doomed strategy? We are living in a time where the most important reforms have never looked less likely despite its new found popularity. There is unprecedented pressure on the world’s governments to keep in line due to challenges specific to our time: climate change, a rapidly destabilizing global order, the rise of organized violent conservative forces, a new dawn of mechanization through robotics and artificial intelligence that threatens millions if not billions of jobs, and a world economic order that vastly constrains the ability of governments to act in isolation. The challenges that the US economy faces are global and go to the core of how our industries have functioned. Those in power are struggling to maintain popular support while at the same time staving off ecological, political, and economic crises as interstate conflicts, climate change, and mass immiseration threaten. Both in terms of resources and political space, the State has less options today than in any recent memory. The turn to social democracy and faith in the state to save us from this terrifying situation arises on some level from desperation and feeling powerless. We shouldn’t underestimate the role fear plays when things are so uncertain and people’s situations are tenuous. Moreover the left and labor have no provided any real workable alternative people can point to as an alternative. Still, the opposite conclusion should be drawn. The people attacking the working class in the past three decades are vulnerable. Now truly is the time to get organized. It is up to us to show the power of working people themselves to construct an alternative. Such a self-organized movement can give a new form of hope that doesn’t rely on the same force that is responsible for maintaining the power of the wealthy increasingly against the world. In reality we are the only real chance for a lasting peace and prosperity. Today the labor movement needs to find ways to assert it’s aspirations and speak to the populations disenfranchised by the society of the ruling class. Our only consistent power as workers is that of our labor in the workplace and our ability to take direct action in our communities to disrupt and re-organize society in our own interests. If we continue to place our faith in the state and the powerful to intervene for us, we will continue to perpetuate new tragedies like the one this year, and do so in an environment where those dreams are more and more certain to guaranty nightmares. We need an alternative to the subservient unionism of labor-management partnership that act as the drive belt for the machinery of various political parties. Apolitical militant unionism likewise will not do. The challenges we face are of global dimensions, potential dire consequence, and require the investment of workers willing to organize and take on issues for the class as a whole. The various national states will act as barriers to the necessary changes that must come in facing climate, the destruction of many jobs as we’ve known them, and destabilization of the balance of military power. It is naive to think that the state can transform itself from the guardian of the capitalists at present to a guardian of the people in spite of the multi-factorial pressures bearing down on and weakening it’s independence in an era of global capital. The state is a direct obstacle to a labor movement that fights for meaningful work and lives, ecological balance, and global solidarity. Unions are being challenged to be more political in a divisive era where there is no way of avoiding drawing lines. A pro-working class labor movement must be internationalist, ecologically motivated, and in opposition to capitalism and the state itself. The challenges we face are products of capitalism itself, and the state is the center that allowed capitalism to be born and sustain itself. This unique time is giving us a gift, at least while there is still space to organize an alternative. The state-aligned socialist and union movements have unfortunately contributed to this rise of dangerous forces, and it’s about time to redirect our energy from waiting for elites towards solving the problems ourselves together directly. We should advocate for self-government by workers and communities organized in direct democracies aimed at providing the fullest development of all by each. Unions can be one force in this direction. Revolutionary unionism or anarchosyndicalism works to replace the dictatorship in the workplace with the self-government of work by workers as well as the replacement of the state organized by the capitalists with a collective self-organization of the community.11 Support and experiments grow each year for such radical egalitarian approaches to social problems such that even the most dire hard defends of hierarchical bureaucracies find the need to pay lip service to direct participation. The resonance of these ideas give us an opportunity to build off of that is unique to our time. Indeed there’s good reason to think we’re living a time of unparalleled potential for the best of the labor movement. For one, the worst of the movement is going to have less resources to repress worker self-activity, negotiate back room deals with employers, and get the backing of politicians seeking to manipulate the situation to their advantage. Union bureaucracies will have to fight or die, and members may feel less willing to support the stagnation they’ve bank rolled previously. The ruling class is also in a unstable position. Social movements often develop when people have a sense of having lost what was rightly theirs. If workers begin to take workplace action aimed at broader social issues there’s a potential of providing needed energy to other issues and movements. An alternative is the only path open when union elections are rigged in favor of the bosses, contracts ham-strung by a booby trapped process, and passive approaches to in-shop organizing financially undermined by Right-to-Work legislation. The answer is unionism based on internationalism, opposing institutionalized oppressions within the class, direct action, politicized solidarity, and syndicalist democratic structures. The failures of the state can be countered by a workers movement that is based on members, organized within the daily life of working class existence, and built upon the direct democracy of people solving their own problems. Such a movement is a model to progressives as a whole who increasingly are dependent on outside funded organizations, top-down command organizations paralleling the business world, and single-issue campaigns without connection to the daily life of the exploited. Our challenges are clearly immense with failure a good possibility. The costs of complacency are too great however. On the horizon perhaps we see glimpses of such a future. Across Asia militant workers movements demonstrate their ability to organize vast horizontal organizations while under repressive anti-labor regimes. In the United States recent events such as the immigration strikes in May Day 2006, Wisconsin’s occupation of the state capital, and renewed willingness to consider strikes amongst the AFL-CIO unions show the potential for broad movements of workers to contest the direction of the state and economy even if only partially successful thus far. Recent struggles seem to point to mass solidarity, political antagonism to the attacks of the state, and organizing independently and against all the dominant political forces. In the coming years the workers movement will be challenged to see if we can answer these calls. 5. Cherny, R. & Issel, W. & Issel, W. & Taylor, K. W. & Schrecker, E. & Zahavi, G.(2004). American Labor and the Cold War. New Brunswick: Rutgers University Press.